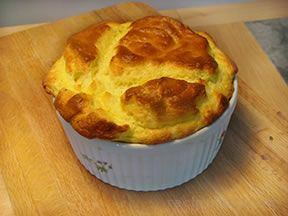 Soufflés are fun to make, impressive to serve, delicious to eat and not so difficult as you may have thought. Preheat oven to 375°F. Grate the cheese. Heat the milk. Separate the eggs, taking care that there is no trace of fat on the bowl or beaters and that no bit of yolk gets into the whites. Over low heat, melt butter in a saucepan. Add flour and whisk in. Whisk in hot milk. Add salt and Worcestershire sauce or curry powder. Remove from heat and add cheese, stirring until it's melted. Beat the whites (with cream of tartar if using) until they make firm, but not stiff peaks. Carefully fold the whites into the yolk mixture (not the reverse). Be gentle so the whites don't lose volume - they don't need to be thoroughly mixed. Pour into a baking dish and bake 35 - 45 minutes. Top should be toasty brown and soufflé should be set, but not firm in the center. An inserted skewer should come out moist, but not juicy. Serve immediately as the soufflé will begin to fall very soon. If it falls, it will taste just as good, but not look so impressive.